This Rotary Action Planing Machine features a 12" solid steel flywheel with four carbide tipped scratcher teeth. 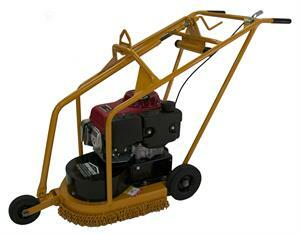 The 11hp synchro-balanced Honda engine allows for surface planing up to 10 squares per hour. Due to an inset rear wheel, tolerances to 1" are allowed on 12" planing paths. It also features a single lever adjustable cutting height and exposed grease zerks for easy bearing maintenance. Work safely knowing the pulley and belt are guarded, and rock guard to minimize flying debris. We sell replacement teeth for this machine.